This poster, published on paper by the Christian Literature Society, is titled Child’s Evening Prayer. In this image, a young mother is guiding her child in prayer. While the pair are indoors, the natural imagery outside the window is a prominent part of the poster. There is a tree with minimal leaves—suggesting an autumnal season—and a waxing crescent moon on the other side of the window. The rich colors in the image are also noticeable, particularly the vivid blues of the mother’s dress and the night sky. The visual interest provided by the colors, the clear message, and the minimal amounts of Chinese and English text make the poster accessible even to illiterate viewers. However, the focal point of the image is the two figures praying in the foreground. Based on the title and focus of the image, the primary purpose of the poster is to promote prayer, especially in family settings. It also seems to have a secondary goal of encouraging mothers to act as role models for their children. It is interesting that the poster does not depict a father guiding his son in prayer, as the father is traditionally the head of the household. 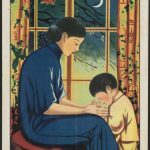 Perhaps the explanation is that the poster is continuing the emphasis on prayer during daily family activities, or maybe the relationship shown here between mother and son is meant to mirror the relationship between Jesus and his mother. The woman is dressed in blue, a color traditionally associated with the Virgin Mary. The poster could be intentionally evoking this parallel to encourage women to emulate Mary. In support of this interpretation, the child is dressed in yellowish white, which Christ is often depicted wearing as it suggests purity and light in many cultures. 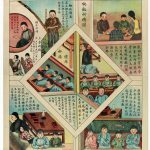 This makes me wonder: did missionaries bring these color associations with them when they traveled to China, or did Chinese people already consider, for example, blue as a color with Mary-like symbolism? What miscommunications would have arisen if a woman wearing blue was like a man in a green hat—a sign of perversion and shame—and missionaries who were not culturally sensitive or educated enough to realize this continually created images of Mary dressed in blue? While this particular example may be fictitious, there must have been some visual codes that missionaries stumbled over. 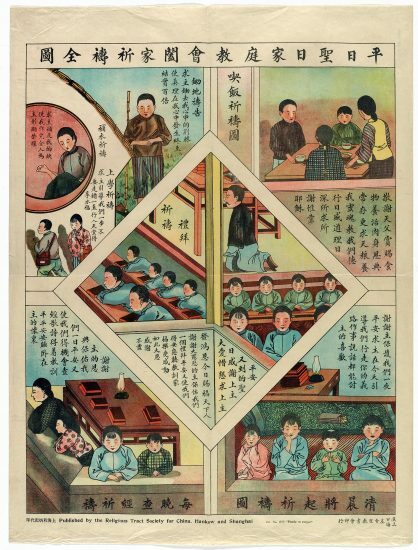 Because the poster has little text besides identifying information and is targeted toward a specific audience—Chinese Christian families with small children—it seems likely that this poster was mostly intended to serve as a reminder for families to pray rather than as a means of encouraging people to go to church or provide classroom instruction. Perhaps they were handed out on Sundays for families to post in common areas of their homes. 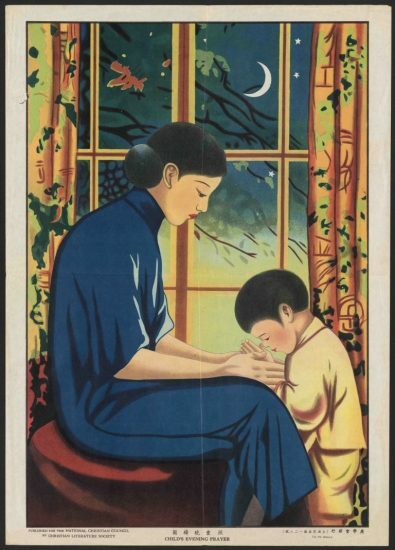 This poster, Family Evening Prayers, was also published by the Christian Literature Society. It too depicts a mother guiding family prayer before bedtime, but there are several key differences. First, this image is far less visually exciting. It is a simple ink drawing printed on blue paper. It also lacks the interesting indoor-outdoor perspective of the other poster. However, the humble background increases the emphasis on the family in the poster’s foreground. The mother in this poster is older and has four children instead of one. The even split between girls and boys shows the importance the poster places on evangelizing to both sexes from an early age. Aside from the obvious message of encouraging people to pray, there seem to be themes of gender equality or tension in this poster. For one thing, this image too lacks adult male influence. Again, this could be taken as a way for the poster to encourage mothers to act as religious models, especially because the focus of the image is on the mother. Her face is more visible that most of the children, and the lighting on her clothes and hair is more detailed. On the other hand, this is clearly set inside a home in the evening, as demonstrated by both the title and the lit lamp on the table. If it is dark outside, why is the father not at home? Rather than encouraging couples to share the religious instruction of their children, does this poster shift that responsibility solely onto the woman’s shoulders, leaving the husband free to spend the nighttime hours however he wishes? It is also worth noting that the feet of the females in the picture are unbound. This makes sense when one considers Christian missionary involvement in abolishing foot-binding. While missionaries’ attempts to Westernize Chinese converts were never without consequences, their campaign against foot-binding aimed to help Chinese women live more comfortable, practical lives. The woman in the poster is living in a comfortably furnished home, and is physically and emotionally close to her children, as viewers can see from the way the children lean against or face towards their mother. 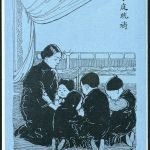 This depiction of a woman with unbound feet as well provided-for and surrounded by loving children implies to Chinese viewers that women with unbound feet can still be desirable wives to men wealthy enough to support them and their children. While this implication is still problematic in that it restricts women to their traditional roles as wives and mothers, the abolition of foot-binding comes with its own ramifications of freer movement for women, both physically and socially. Overall, this poster seems to portray the mother as a leader and model for her children, but mostly within the confines of her own home. This poster is less ornate than the first, possibly due to a lower budget, difficulty in procuring production materials, or time constraints. However, like the first poster, this one seems well-suited for home use, for similar reasons. 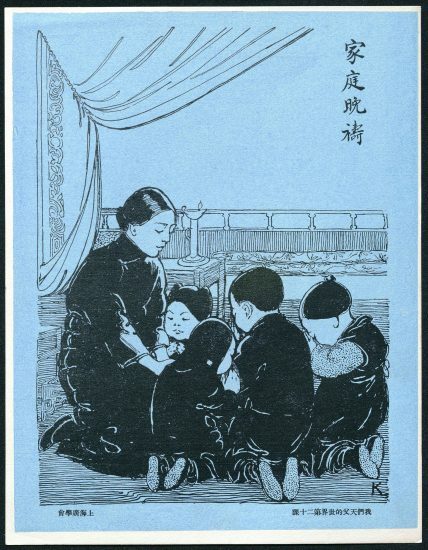 This poster, titled Family at Prayer, was published by the Religious Tract Society of Hankow and Shanghai. The text-heavy, geometric design focuses on family prayer throughout the day, rather than solely depicting evening prayer. It shows multiple scenes, some focused on the entire family unit and other scenes showing individuals or small groups. It places prayer in a broader context than previous posters by showing family members praying together outside the home as well as within it. This poster also deviates from the previous two by depicting children praying with and without guidance from their elders, though by including a template for how they should pray on their own, the poster does offer its own form of guidance. It also shows adults praying alone, encouraging parents to pray for their children’s benefit and for their own sakes. While there are still fewer adult men than women in this poster, the inclusion of a few men results in less ambiguous gender roles in this poster than the other two. Nonetheless, when the family is shown together at home, it is the mother leading the children in prayer, so this poster still fits with the theme of fostering spiritual leadership in women. All of these changes point to a key difference between this poster and the others: where the first two posters were meant to encourage their audience to pray, this poster focuses on how they should pray. This poster is intended to instruct, rather than inspire as the other two are. This one is also much more visually complex than the other two. It has more focal points, more text, more color, and a more complicated layout. The number of shapes and colors in the image can be overwhelming at first glance, which necessitates that viewers have time to focus their attention to understand the full message. Thus, this poster would need to be placed where the audience would have time to study it carefully. The poster could have been placed in waiting rooms at missionary medical buildings or other charitable establishments. It could also have been displayed in classrooms or gathering spaces for the community, as any of these locations would give the viewer sufficient time to study the poster. In some ways, a classroom seems like the most appropriate place for this poster. Considering how focused on a literate audience it is, where else would be a suitable location for a poster that excludes many viewers from fully appreciating it? For that matter, why create a poster that is so difficult for viewers to access? Because of its method of delivery, the poster seems somewhat self-defeating. However, it is also true that if missionaries always restricted the amount of text on their posters it would be challenging for the to deliver complex messages like the one in this poster. I selected these three images because they all explored different aspects of family prayer. The first focuses on the mother-son relationship, the second is concerned with the mother’s relationship with her family as a whole, and the third explores multiple family dynamics between siblings, spouses, and parents and children, as well as their relationships within their broader faith community. All of them also lack any Christian iconography such as crosses or images of holy figures. Other Chinese religions kept relics of important persons inside temples, but was it considered culturally or morally inappropriate to keep holy images inside homes or school buildings? Around the world, many Christian sects—particularly Catholics—use crosses, relics, and other icons as meditative aids. In a group of posters about prayer, it seems odd that no such images are used. More questions arise from looking at the three posters together. First, why is there so much emphasis on mothers as prayer leaders and role models? In Joseph Ho’s article on missionaries’ visual perspectives, he emphasizes the role of images in demonstrating the work missionaries did in order to garner support from their sponsor congregations (46). These posters could have been taken back to Western countries to show potential sponsors how missionaries were reaching out to women in their evangelical efforts. The first poster in particular seems well-suited for this purpose, because it contains English translations and color symbolism recognizable to Westerners. Finally, which poster would be most effective in reaching and engaging the widest audience? It seems that the third poster requires too much skill and attention for it to be the most effective. The first poster has simplicity and beauty to recommend it. However, its message is not as nuanced as the second poster with its anti-foot-binding undertones. In the end, I think the first poster is the most effective in drawing and holding the holding the eye due to its colorful and uncomplicated layout, and its message is clear enough to make the poster effective as a reminder for families to pray together.